When it comes to needing wasp control services, Active Pest Solutions are your local experts. Whether you’re looking for wasp control in Fife, wasp control in Perth or wasp control in Kinross – or indeed in any other areas of Central Scotland! – our experienced, qualified pest controllers have the knowledge and experience to dispose of any wasps that are causing a nuisance at your property. And they’ll do so quickly and safely. Removal of wasp nests is a major aspect of our pest control operations in homes and businesses in Perthshire, Fife and Kinross-shire. We’re called out regularly between the months of May and October, and occasionally even in November. Our wasp control services requests are usually peaking in July, August and September. At Active Pest Solutions, we have 15 years’ experience in wasp control. Our qualified wasp disposal technicians will guarantee to eradicate wasps nests, at a very competitive price, using specialist wasp control equipment combined with wasp-specific products which are only approved for use by professional pest controllers. As members of the Fife Trusted Trader Scheme and Perth and Kinross Better Business Partnership, our working practices, pest control qualifications, customer service and integrity have been checked and approved by Trading Standards officials, so you know we’ll deliver wasp control you can trust. If you live in Scotland, there are three main wasp species that you might find in your home, garage, office or commercial premises: Common wasps, German wasps and Norwegian wasps. All three follow a similar breeding pattern. After overwintering, the fertile queen wasp emerges in spring to start the development of a new wasp nest. She feeds and nurtures the initial batch of grubs herself until they are fully grown wasps. These female worker wasps then take over the development of the nest – and the feeding of the multitude of grubs the queen endeavours to produce. Wasp bikes, as the nests are also known, are made from wood scrapings and wasp saliva, which is then moulded together by female worker wasps to build the rounded papery wasps nests we are familiar with. The wasp nest develops and grows and can eventually hold thousands of potentially aggressive wasps. Male wasps are produced towards the end of summer, specifically to fertilise the emerging new queen wasps. At the end of the development period (late summer or autumn) the new queen wasps leave the nest to hibernate over winter and the old wasp nest will die off, never to be used again. Why do You need Wasp Control Services to Get Rid of Wasps Nests? A key reason why our wasp control services are popular is quite simply a lot of people are afraid of wasps. And that’s because these familiar black and yellow insects have an extremely painful sting. In some cases, their stings have even proved to be fatal if individuals are particularly susceptible or if the sting is in a dangerous area such as the throat. Initially, wasps are kept busy tending the nest. However, later in the season – as larval rearing is reduced – the workers seek out sweet substances and can become a significant nuisance in homes, bakeries, fruiterers and food production facilities such as jam or sweet factories. They can also be a significant pest at garden parties or barbeques, where they are attracted by soft drinks and mixers, sweet marinades for meat or fresh fruit. 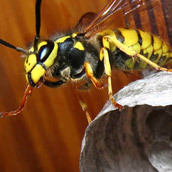 The first indication of a wasp nest in your home, garden or business premises might be a regular stream of wasps flying to or away from a wasp nest. Or maybe you’ll hear a strange noise coming from behind a wall or above a ceiling, sometimes accompanied by wasps finding their way into your home or office. Wasp nests can be found in any suitable site, including gaps in walls, branches of trees and bushes. Wasps nests in bird boxes or in compost heaps are common, too. Nests are also found in gaps at the eaves of a house leading to attics or roof spaces, under roof tiles and slates or in air bricks around houses. In addition, they can be found in holes in the ground or in sheds and garages, etc. So, all the more reason to get in touch and ask about our wasp control services and find out how we can help. In almost every situation, APS pest control will guarantee to resolve your wasp problem. Better still, we’ll do so at a competitive rate. As pest control professionals, we would advise members of the general public not to tackle wasp nests themselves. Being attacked by even a few wasps – far less an entire nest full – can be a very painful experience if you don’t have the proper equipment or expertise. If you suffer from a wasp sting allergy, and especially if you know that wasp stings are likely to trigger an anaphylactic reaction in yourself or any other family member, it is particularly important that you seek professional help to deal with any wasp nests that you spot at your home or in your business premises. So if you want your resident wasps to buzz off, please don’t take unnecessary risks: simply call in your local wasp control experts! For professional, effective low-cost wasp nest eradication or removal, ring Derek now on 01577 862035 or request a call back from Active Pest Solutions by emailing us.